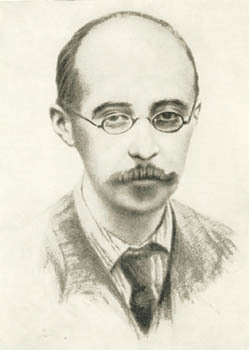 Alexander Friedmann was born in St. Petersburg in 1888 and died in Petrograd (former St. Petersburg, then Leningrad, now St. Petersburg again) in 1925. In 1922 he published his famous paper on cosmology where he discovered nonstationary solution of Einstein's equations, describing closed expanding space with beginning and end of the Universe in time-closed Friedmann model. In 1924 he published a paper on expanding Universe with negative curvature, infinite in space but having beginning in time. At that time he also published a popular book "The world as space and time" (see translation of Friedmann's works on cosmology in French in "Alexander Friedmann, Georges Lemaitre, Essais de Cosmologie", textes choisis, presentes, traduits du russe et de anglais et annotes par J. P. Luminet et A. Grib, Seuil, 1997) where discussed a new vision of the expanding Universe with possible beginning and end in time.